posted: July 26, 2018 by: Kristi Sanders at Times Herald Tags: "Clinic Specials" "News"
There are an estimated 30-to-40 million feral and stray cats roaming in the United States according to the Humane Society of the United States. And while the shelter does take in hundreds of cats every year, there is still a big population. "Cats can have litters two - to - three times a year and have up to eight kittens per litter. So one outdoor cat that isn't fixed can turn into 20 in a year," states Washington Animal Control officer Jordan Fields. Many people believe it is OK to release cats into the wild and lots of oepole like to feed the stray cats in the neighborhood. While they might feel better about filling the cats' bellies, they are actually adding to the problem. 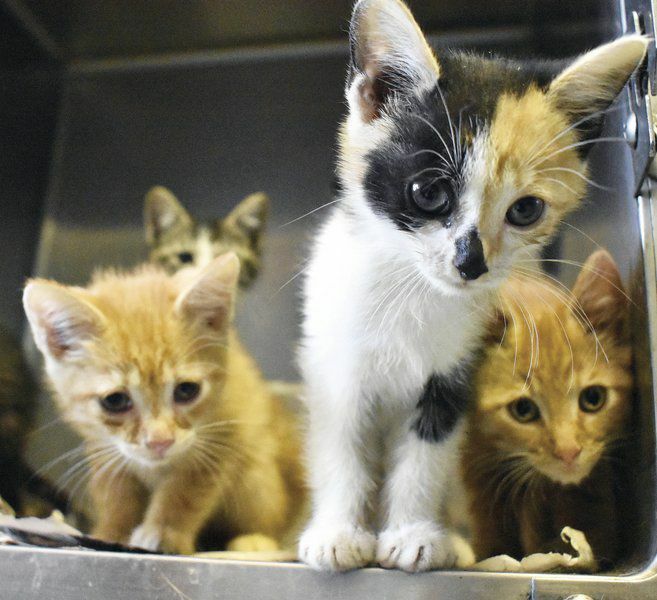 "There are currently hundreds of feral and stray cats roaming around town," Fields said. "If you have a cat problem around your home, you should call animal control." The American Veterinary Medical Association, or AVMA, states that "The welfare of these (feral) cats may be significantly diminished. Their life expectancy is radically reduced due to death from trauma, disease, starvation and weather extremes. These same factors may also contribute to an overall poor quality of life." Also when a food source is found, a colony of cats will form. This means more cats living in one area which leads to the spreading of diseases, overpopulation, fighting and injury of cats and an increase in kittens. Some people support trap and release programs but Fields explains that this doesn't really help the cats. "They still have to hunt for food," Fields said. "They still need shelter and care so trap and release is not a solution."" The AVMA also shows there are negative impacts to the community besides the cat's health and said, "Free-roaming, abandoned and feral cats are non-native predators and cause considerable wildlife destruction and ecosystem disruption, including the deaths of hundreds of millions of birds, small mammals, reptiles, amphibians and fish." Feral cats are natural predators and will hunt for food. One major solution to help fix this problem is owners fixing their pets. "The more animals that are fixed, the less they are overpopulating," Fields said.